Located east of Valence (South France) in the center of recent districts, Jean Perdrix Park is a contemporary public park in landscape style. The open and changing park covers an area of some 26 hectares (about 64 acres) and is composed of more than 4,000 trees. 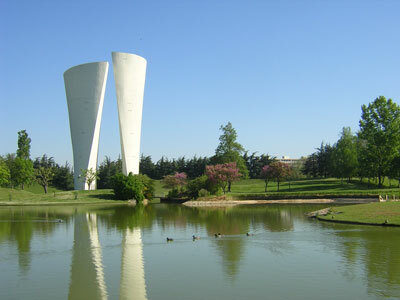 It was designed by Michel and Ingrid Bourne, landscape architects, and developed from 1972 to 1976. Ground waves shape a green amphitheater, in the middle of which the giant (57 meters high) and outstanding work of art created by Philolaos, a Greek sculptor, is reflected in an artificial lake. This sculpture, which is used as water tank, was awarded as best urban artwork in France and designated as 20th century Heritage. May to September : 7 am. - 8 pm. October, February to April : 7. 30 am. - 6 pm. November to January: 8 am. - 5.30 pm. Guided tours: 1st weekend of June "Go to the gardens" and programming "Valence, town of art and history"
Guided tour "Go to the gardens" : free. Others Guided tours by appointment : 4 euros /person.